For more information regarding the Pedestrian Ramp Program at NYCDOT, please visit www.nycpedramps.info. Pedestrian ramps provide access on and off our streets and sidewalks and are an essential tool for all pedestrians, especially aging New Yorkers and persons with disabilities. NYC DOT maintains the city’s 12,760 miles of sidewalks and 162,000 corners. Currently, DOT addresses pedestrian ramps through the resurfacing of city streets, inspection of sidewalk defects, 311 complaints, and implementation of street improvement projects. Additionally, DOT is currently undergoing an ADA self-evaluation which includes identifying existing obstacles that limit accessibility and proposing methods to address those obstacles. Once this process is completed, DOT will update its ADA Transition Plan, which will be made available for public comment. 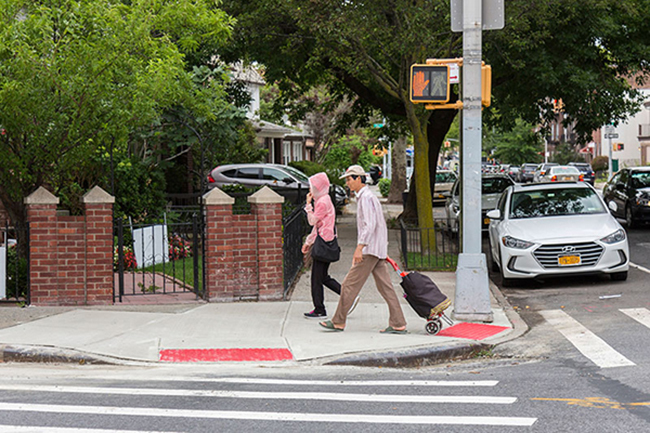 NYC DOT has developed a program dedicated to upgrading and installing new pedestrian ramps and is committed to making our pedestrian space safe and accessible for all road users. New and upgraded pedestrian ramps include a red (or white in special districts) detectable warning surface to help guide people who are blind or have low vision. In addition, NYC DOT is in the process of surveying all pedestrian ramps throughout the city to create a comprehensive inventory and assessment of current conditions. This detailed citywide survey is anticipated to be completed by the end of 2019. This effort will help prioritize construction in key areas of the five boroughs based on need with the intent of addressing all corners in the city. The critical components of the program include: data collection, analytics, public outreach, stakeholder engagement, technical design, legislative changes, developing policies for adherence, and training for other agencies, developers and utility companies. NYC DOT values questions, comments, and concerns from New Yorkers. There are several ways to get in touch with us: NYC 311 is the official source for New York City non-emergency government services. Visit nyc.gov/311 to report conditions such as damaged sidewalks or curbs. You can also reach 311 by phone, the free NYC 311 App, Twitter, or Facebook. If you have an inquiry or complaint regarding an accessibility issue, contact Quemuel Arroyo, DOT’s ADA Coordinator and Disability Service Facilitator. For more information regarding the Pedestrian Ramp Program at NYCDOT, please visit www.nycpedramps.info.